I agree, and the 10,000 unit differences are easy enough to explain various ways, but -80,000 in Japan and +90,000 in Europe are weird, those are larger changes... I'd think consolidated vs. non-consolidated could only decrease sales, not increase them, and that since Japan is the home region it wouldn't be affected by that -- all systems sent out of the warehouse for Japan went to retailers, yes? BKK's explanation at the top of the thread is that Sega sold 110,000 systems marked for overseas in Japan instead, but how does the discovery of the change in reporting practices affect that? I'd think it would. Those figures were reported after the change in reporting practices, so that doesn't really change anything that I originally posted (only the LTD). Still, that was purely speculation on my part. Anyway, I've discovered another issue now. 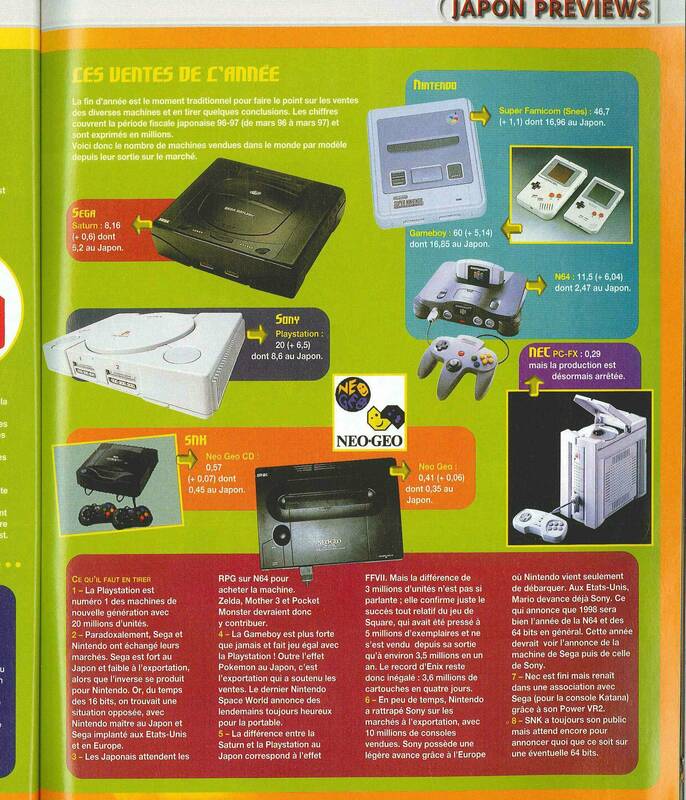 According to their 98/99 annual report they also launched Dreamcast in the Asian region in that FY. Thus 900k for first FY includes both Japan and Asia. That means that LTD Japanese shipments could be inflated somewhat, although if only token shipments of a few thousand were made in that FY it may not have been enough to change the figures which were rounded to 10k. Yeah, finding a definitely accurate Genesis sales total seems somewhat impossible. My guess is 35-36 million, more if you count licensed clone systems which can't play cartridges. I'm starting to think that the 30.75m shipped by Sega may be accurate....Consolidated/Non Consolidated/Sold to consumers. SoA reported all of those depending on the year. Adding them together results in potentially counting the same console twice or multiple times for the LTD. I'll look into this tomorrow, but according to Famitsu MD was at 25m outside of Japan, and 3.58m in Japan as of 96/03. MD was discontinued in Japan then, but still being shipped to the west. Sega supported it for the next FY, but sales were low. Then for holiday 97 retailers in the US were complaining that MD sales were low and MD was no longer being manufactured anyway. The last significant first party MD releases were holiday 96, so I think it likely that FY96/97 was the last year that Sega manufactured MD before licensing it out to Majesco for 98. ~35 million, not 30 million, Genesises sold. And as for Sonic, didn't almost everyone who owned a Genesis, in the US at least, have Sonic? It's an incredibly common game... and I wonder, it probably doesn't, but would the Genesis 6-pak numbers be included there (since Sonic is on that cart), or not? Or does that 15 million number also include other ports, like how Nintendo's "18 million copies of Mario 3 sold" number apparently includes ports as well as the original NES game (which sold amazingly, but not 18 million; 11 million US+JP, not sure about Europe). It seems unlikely, but Sonic was bundled with MD for quite a while, so I guess that if we can work out annual shipments whilst Sonic was bundled then we can get a rough guestimate of the minimum number of roms that were produced. Tasty, could you upload the scan? SMB3 (Famicom/NES) final LTD (shipment) is 17,28M (of course include bundled units as it should). 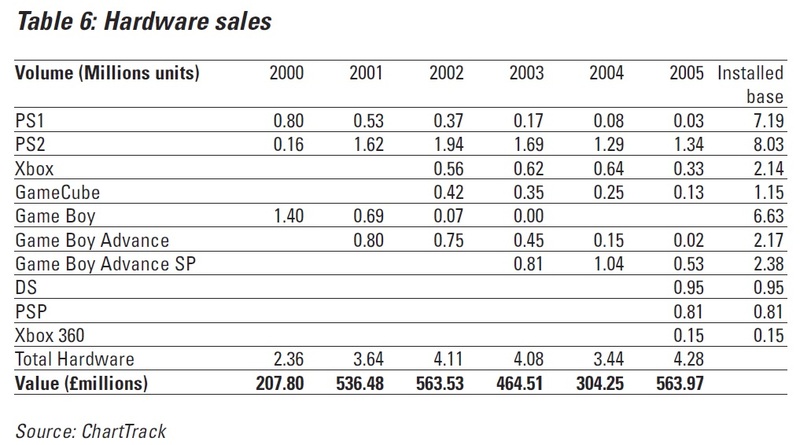 Nintendo software sales (at least for million sellers) shouldn't be a mystery anymore (although some GBA/GC games released close to 2006 might be a bit higher now). Hmm... could this actually explain that 80k drop between the two in Japan? I don't know though, there's nothing like that to explain the 90k increase in Europe. As for only 25 million outside of Japan as of March 1996, that sounds a little low; not impossible, but a little low. I do think the 30.75 million number is possible, but it seems more plausible as a number for sales as of March 1996 than as of end-of-cycle (that is 1998, not including Majesco since those were separate). Yeah, the bundling is the key. They are talking about unbundled units. Sometime wikipedia article are quite poor. I don't have this issue unfortunately. I'm just going by this source on Wikipedia. 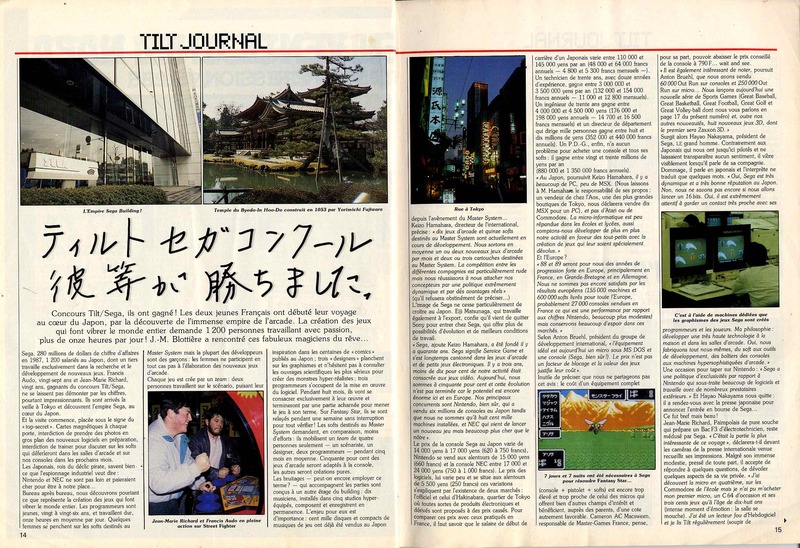 Famitsu reported 3.58 million in Japan and 25 million for the United States and Europe by the end of March 1996. "Yearly market report". Famitsu Weekly (in Japanese) 306: ~4. June 21, 1996. It may explain some difference. Still, it was just a breakdown of remaining inventory at the end of 2000. If any of that inventory was still in Japan when they decided to slash the price and dump the remaining stock then it probably wouldn't have been cost effective to ship it half way around the world, so it seems plausible that it was re-assigned to Japan. Yeah, this is the article that made me realise shipments from Japan to US were little to nothing in FY97/98. Sega was on verge of dropping one-time market leading Genesis before MSI stepped in, Sutton said. SOA sold about 400,000 16-bit consoles in N. America last year, based on estimates extrapolated front NPD Group's Toy Retail Statistical Tracking Service. That compares with just over one million Super Nintendo Entertainment Systems (SNES) sold by Nintendo of America (NOA). "They weren't manufacturing any more so there was actually a shortage of Genesis systems last year," Sutton said. 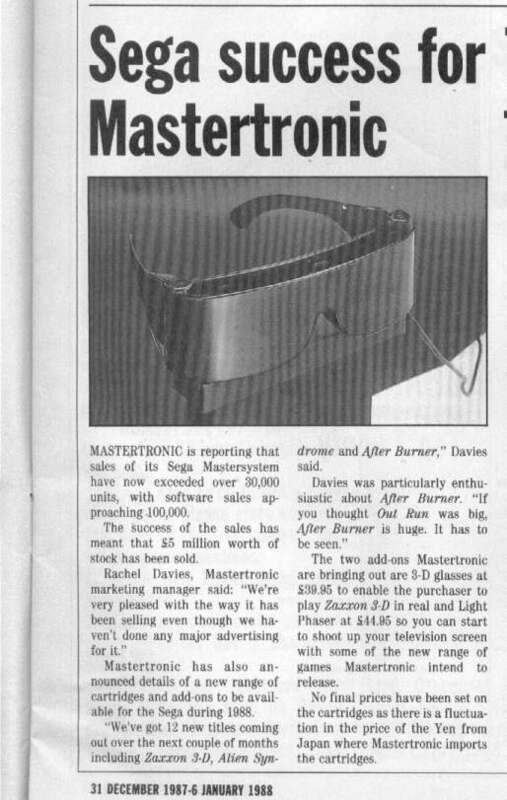 So 400,000 sold from retailers to consumers in 1997, and a note that it was no longer being manufactured. That's a number that could easily have already been in the retail channel and SoA's inventory prior to April 1997. Asian shipments are unclear, I've only seen Sega give a breakdown for that region for Saturn and Dreamcast. It's complicated by the fact that Asia was split between NTSC (South Korea, Taiwan, and Philippines) and PAL (The rest of Asia all the way through to Turkey). NTSC Asia is the same software region as Japan, but Samsung had the license for South Korea and manufactured MD themselves. Little is known about official MD release in Taiwan and Philippines, but Taiwan was the major manufacturer of MD clones, so they would have had a difficult time competing with those on price. Still, there were some manufactured, so the question is were those counted as Japanese sales, were they included in "worldwide excluding Japan", or were they simply unreported? Saturn and Dreamcast were released throughout East Asia as NTSC-J, and we see them combine Japan/Asia in Dreamcast shipments in the chart posted earlier in this thread. 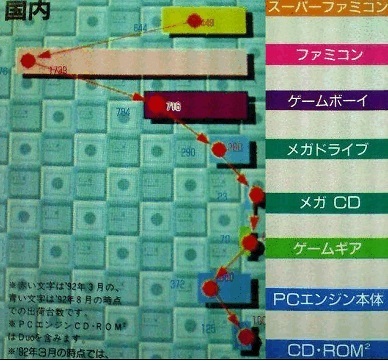 PAL Asia was the same software region as Europe, but used Japanese shaped carts, which prevented them from fitting in European MDs (but not vice-versa). A small number of MD1s were sold in Hong Kong and China by WKK, a Hong Kong based OEM who manufactured Sega's hardware for them in China. Sega only really pushed into Asia with the release of the MD2 in 1993 signing up official distributors across the region. Still, each market was pretty small, and the whole region was awash with MD clones by then, so the question for these are if they are counted as European sales, their own region (unreported), or just worldwide? Another problem is Australia/NZ. That's probably a bigger market than the Asian region, and was run by Ozisoft who were completely independent of Sega Europe. They manufactured their own software, but imported hardware from Sega. On a technical level they are the same region as Europe, but were they counted as European sales? Note; Some errors with some Nintendo numbers, correct ones can be found here. Let's see if I can do anything. I've always only seen the Japan scan from that article. 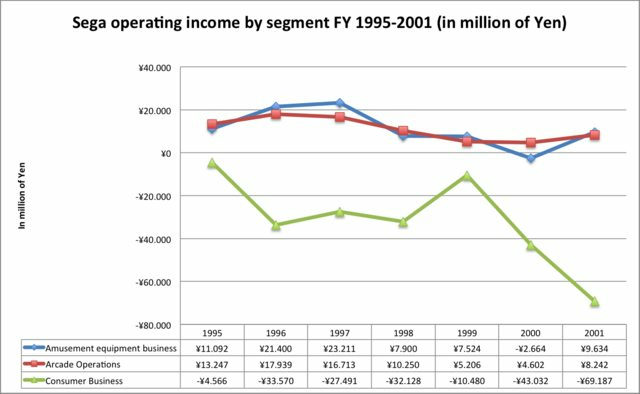 Seems console business (that is consumer business) was losing money since FY'95 (April 1994-March1995). Six years of straight losses. You have 90s revenue/profit figures for Square/Enix by any chance? I looked their IR site but earliest reports goes back to 2004 only. I always hear Enix was basically the big guy in the merger and Square was dead broke but wonder how accurate is all that. I always hear Enix was basically the big guy in the merger and Square was dead broke but wonder how accurate is all that. Enix outright bought Square, in that regard it wasn't a merger. However after the merge the Fukushima family (Enix former owner) was the largest stockholder in SquareEnix with 31,94% (21.96+8.86+1.12). I think Note 1 says that for Nintendo shipments 1993 is 15 months from Jan 93 - Mar 94. 1992 and prior is calender year, 1994 and later is Apr - Mar. 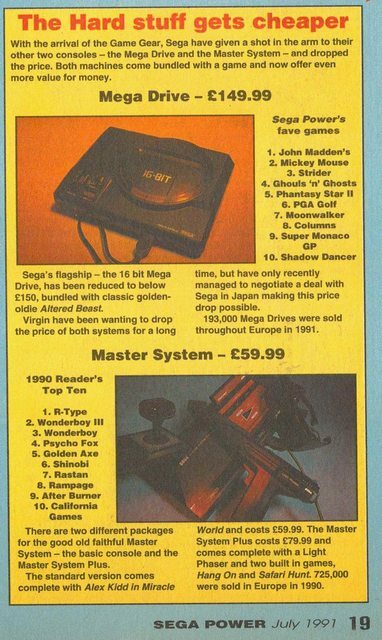 Mega Drive: 88 and 90 deviate from this, and results in a too low LTD. 91 onwards does agree. Game Gear: Disagrees with the limited amount of data in this thread. Adds up to too high LTD.
Saturn: Matches this, and all data posted. Dreamcast: Also gives 200k for 01/02, plus a further 6k for 02/03. 98/99 doesn't seem to split Asian sales from that year. For Sega it seems that data for MCD onwards is accurate for Mar-Apr, but earlier numbers seem off. Maybe mixing CY and FY as with Nintendo? PC Engine: Figures match posted data, numbers are close to imprecise pixel counting. PC-FX: Numbers match here bar 0.01m difference in LTD which can be explained by rounding. 3DO: Matches known figures, but doesn't mention Sanyo. Unclear if Panasonic only or Sanyo is included too. Probably the latter. 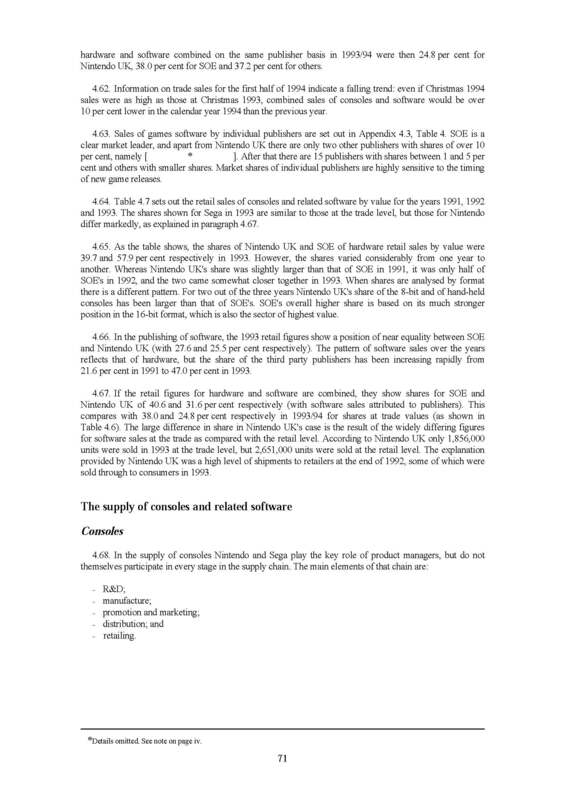 CESA reports 3.320.000 for the WonderSwan as of December 2006. Numbers above add up to 3.33m (slight difference can be explained by rounding). Note 4 seems to say that SwanCrystal is not included. Not much problem, after the first 40K shipment Sanyo discontinued the system from the market (if memory serves me right). Don't forget WS was released also in other asian countries like Hong Kong. Toshiba Corp. said it would drop production of 3DO's video game machine and Sanyo Electric Co. said it would cut back on the number of machines it makes. Sanyo produced 20,000 3DO machines in the fiscal year ended March 31, down from the 60,000 it planned when it launched the machine last October. I thought that maybe the difference between the 720k and 750k figures could be Sanyo, but maybe the 720k figure is non final. Figures from H1 96/97 could confirm that. That would also help to push it over 3.5m, although sometimes Asian shipments are included with Japan, so it's possible that those are included within the 3.32m. What does 9203 and 9209 mean? Why not reflect that in the final sales numbers, then? That is possible. Sega more than made up for it by selling several million in 1998, but those wouldn't have been counted in the 30.75 million number of course. But yeah, failing to have enough Genesis systems (and games!) available in 1996 and 1997 was something most all Genesis fans agree was a major, major mistake of Sega of Japan's. They focused too much on Japan and too little on the West. Hmm... tricky stuff. But I just can't quite believe that Asia, while small, could be SO small that it'd be under 100,000 total sales... even the Dreamcast sold four times that in Asia; yes, I know the markets were different, more pirate clone consoles of the Genesis, etc, but still. Really the only explanation here that makes any sense that ends up with only 30.75 million systems sold not counting TecToy or Majesco is if NTSC Asia numbers being combined into the Japan numbers or are unreported and unknown (and thus that'd make it one more thing to possibly guess at and add to the 30.75 million number, as TecToy and Majesco numbers must be), and Australia numbers combined into Europe, leaving only PAL Asia for that ~100,000 or less -- but we have no idea if any of these things are actually the case. 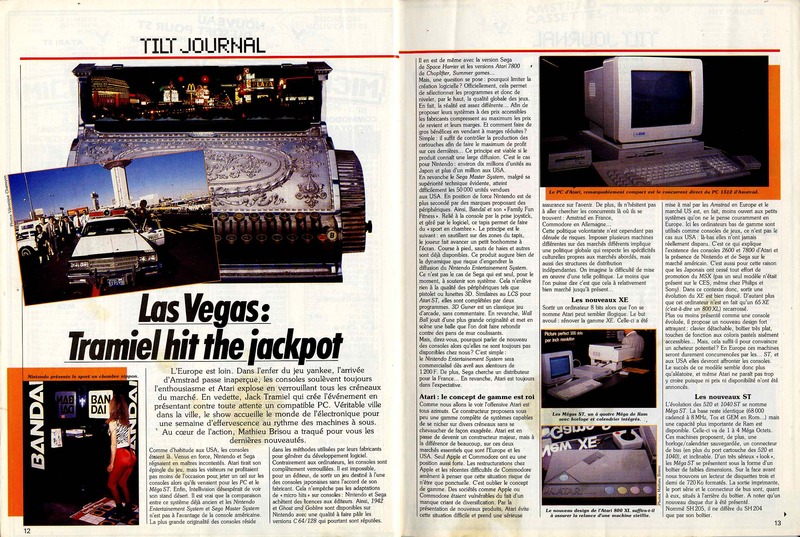 And as for the Turbo CD, Victor Ireland (of Working Designs at the time, TG16/CD developer) estimated several years ago that he thought that the Turbo CD sol 20,000 systems, and the Turbo Duo also about 20,000 Turbo Duo. Now his estimate may be as of mid '93 when he stopped supporting the system, I'm not sure, but sales after that were not good, the Duo bombed hard unfortunately. To that I'd add an unknown but probably small number of systems sold by TZD from 1994 on, but over 50,000 for the two combined is... unlikely, sadly, I think. Awesome system, it just didn't sell at all. I've done extensive research based on NPD data I could gather and it looks like Genesis sold between 16-17m in the USA, that includes the Genesis 3; I'm not sure about this 20m business that's likely just NA shipments. SNES Sold 17-18m, that includes the Jr. model. NPD numbers back then weren't accurate, though, and were consistently too low, so that doesn't mean it wasn't actually 20 (or rather 22) million, I'd think. I'm not sure about this 20m business that's likely just NA shipments. Here's the exact quote: "After the company sold some 20 million 16-bit Genesis consoles in the United States alone in the early 1990's, its 32-bit Saturn flopped. Introduced in 1995, only two million of the consoles sold in the United States, and five million in Japan." 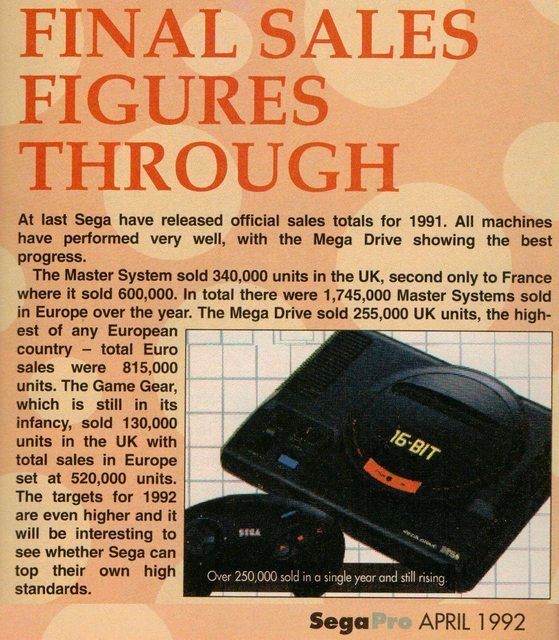 http://www.nytimes.com/1998/03/14/business/international-business-sega-enterprises-pulls-its-saturn-video-console-us-market.html?pagewanted=1 Clearly states that it's not all of North America and is sold numbers, though sure, it could be shipped (because lots of the numbers in this thread are of course shipped and not sold numbers), but it's impossible for shipped and sold to be 3 or 4 million apart, yes? Yes, they do use the word "some 20 million", but you wouldn't round 16 or 17 to 20, not when the same sentence differentiates 2 and 5 million as Saturn numbers for US and Japan. SNES Sold 17-18m, that includes the Jr. model. Possible, but 5-6 million in the rest of the Americas, really? Were the markets there really nearly that large? Well Aqua and I discovered the consolidated vs. non-consolidated reporting method used before 2000 by the big 3, and could the gap be off that much, yes! That's why they didn't want shareholders to know! it wasn't just about convenience. 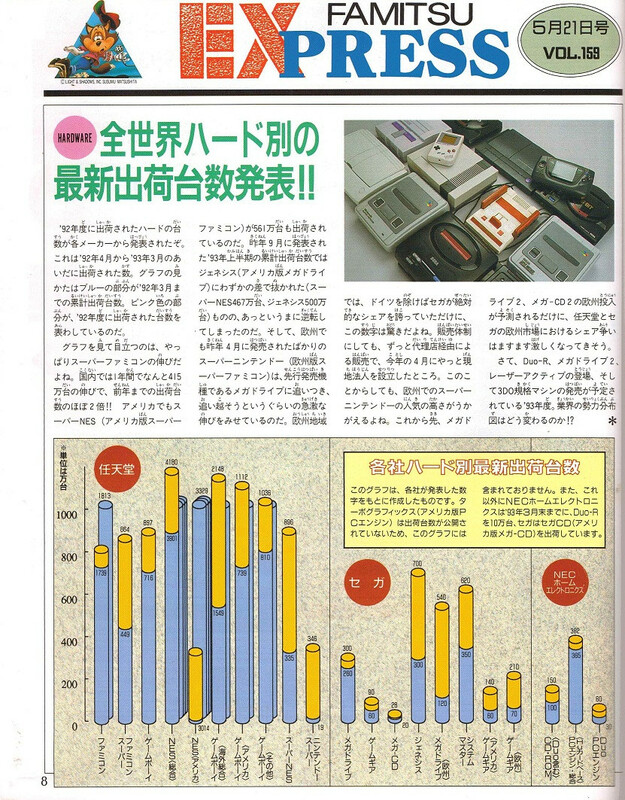 Also it's interesting to note in Japan how "inaccurate" Famitsu sales were before 2001 when it came to Nintendo (and Sega) or were they? How did famitsu get accurate suddenly inline with official figures after 2000 (along with Dengeki)? 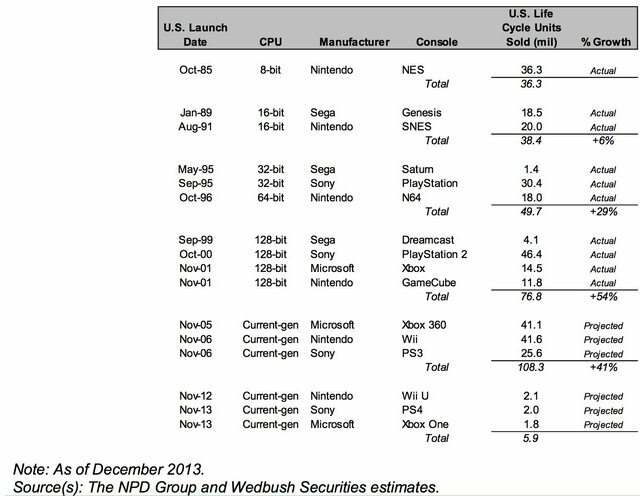 As for that quote, for one the Saturn sold 1.4m according to NPD, the NPD, yes, was less accurate but they revised their data to match the big three's internals from my understanding. That number is not raw but a revised figure from sometime after the original data was reported (the data was compiled around 2002-04). Sure the original raw data was lower than that 1.4m but I don't think we have reason to not trust these revisions. No those markets weren't, remember how we uncovered Sony's reported "shipments" were so far off? Back then manufactured included defective units which were counted as shipments (and then sales), ridiculous. Seeing 3-4m too high is nothing to how exaggerated Sony's reported data appears to have been. The reported data were just overblown back then. I don't trust the reported figures before their consolidating methods changed, I think they were all too high back then. A couple of things. I just don't buy the idea that the SNES sold better in the US. If we go by the numbers reported by the companies at the time, I don't see any way Nintnedo could have sold better in the US, or in the Americas as a whole. And if the numbers are off, saying tha Sega's are far less accurate than Nintendo's seems unlikely, when there are far more stories out there about Nintendo and especially Sony messing with their numbers than Sega (other than the one in this thread about the Dreamcast). I mean, Nintendo said 23.35 million SNES sales in all of the Americas. Sega said about 20 million US + 2-3 million Brazil + 1.5-2 million Majesco (US) + unknown Canada and other Latin American sales, if they weren't included in the US number. Even if that last group WAS included in the US number even though the article specifically said US only, that's still over 23.35 million by a comfortable margin. Of course, the trick here is, what percentage of those SNESes sold in the US, versus other nations? All we have to guess at that is that inaccurate NPD data. But in order to beat the Genesis's reported US total, you'd need over 21.5 or 22 million of those 23.35 million to be in the US, and while it was probably close to that, Canada, etc. should edge it under that. And again... if these numbers are all too high, the idea that Sega's are more over-reported than Nintendo's isn't one I am going to believe without some pretty good evidence. What are you saying here, that the old inaccurate numbers are lower because you think consoles sold less than companies said? I don't believe in conspiracy theories, and we have reason to doubt a lot of older numbers, reporting wasn't as good as it later became. This was certainly true in the US, at least! Wasn't it pre-1994 stuff that's the most inaccurate, though, even if the big retailers weren't fully included until the '00s? FFIII is from late '94. Shipment data is much better IMO. BTW is PS1 LTD 102,49M related to manufactured units or shipped units? I don't remember if Sony updated the figure when they switched method in the PS3 early days. NES sold 36 million in US alone? That can't be right, Nintendo official data have it at 34 million shipped in the entire Americas region. Dreamcast shipment is 2.49m for Japan? I believe Famitsu number is 1.918m at the end of 2002. It is, but we don't have SNES and Genesis shipments just for USA. This 20m vs. 18.5m should be NPD sell through data. Don't know how reliable it is, but at least is something. 2.17m through Q1 2002 according the Media Create. I don't trust sell through estimates much either. PS1 figure is "production shipments". The PlayStation 2 (PS2) console was the most popular video game hardware in 1st-qtr 2002, with 1.19 mil units sales to raise total sales to date to 8.25 mil units, according to Media Create. PS2 was followed by Game Boy Advance with 897k and 4.88 mil units, respectively, GameCube with 484k and 1.65 mil, Xbox with 164k and 164k, PlayStation with 78k and 17.05 mil, Wonder Swan Colour with 69k and 1.27 mil, Game Boy Colour with 34k and 5.02 mil, Dreamcast with 7k and 2.17 mil, Nintendo 64 with 2k, Game Boy with 2k and 10.67 mil and Wonder Swan with 2k and 1.02 mil units. Separately, PlayStation 2 software sales reached 7.32 mil units for a 53.71% market share in 1st-qtr 2002, followed by Game Boy Advance software with 1.94 mil units for 14.24%, Playstation with 1.83 mil for 13.4%, GameCube with 1.42 mil for 10.4%, Dreamcast with 401k for 2.94%, Game Boy Colour/Game Boy with 326k for 2.4%, Xbox with 228k for 1.68% and Wonder Swan with 153k for 1.13%. Sony claims to have achieved global sales of 3.4 mil units of its PlayStation games console since the launch of the platform in September 1995. The company's total PlayStation sales in Europe are claimed to have reached 518k units. According to Marty Homlish, head of Sony Computer Entertainment's US operations, sales of the PlayStation format in the US are five times greater than sales of Sega's Saturn format at retail level. Sega claims to have achieved sales of 2.2 mil units of its Saturn format in Japan, while US sales are estimated at 400k units. 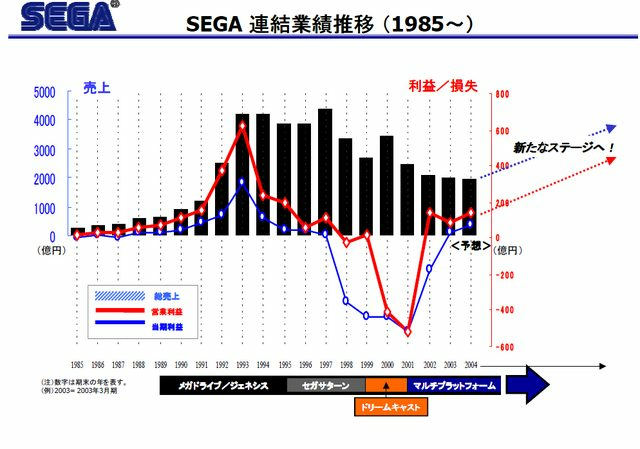 Sega (Japan), video games maker, reports consolidated recurring profit for the year to March 1996 down by 65% to Y4.4 bil, vs Y12.8 bil for the previous year period, on sales steady at Y384.8 bil. The company's fall in profit was attributed to increased competition in the US, a decline in European sales and reduced demand for the company's 16-bit machines in the US and Europe. The company's results also include a charge of Y26 bil covering the restructuring of its operations in Europe. For the year to March 1996, sales of Sega's 32-bit Saturn machine stood at 2.5 mil units in Japan, as well as 600k units in the US and 300k units in the rest of the world, including Europe. 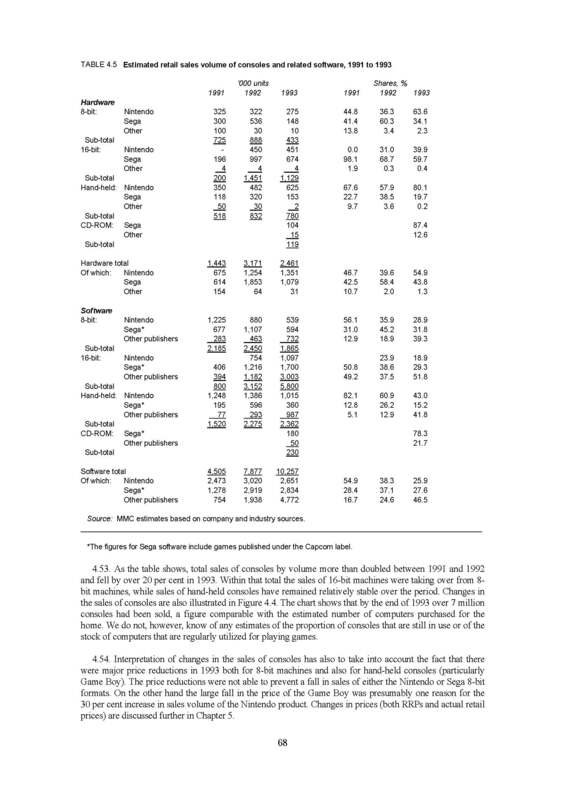 Sega (Japan), amusement park and electronic games company, reports recurring profit for the six months to 30 September 1996 up by 16% to Y12.76 bil, while net profit for the period rose by 9% to Y6.03 bil from Y5.53 bil. Sales for the period rose by 12% to Y174.86 bil, vs Y156.43 bil for the year-earlier period. The company's consumer games unit saw its sales rose by 14% to Y85.4 bil from Y74.7 bil, with sales of Sega Saturn systems standing at 2.35 mil units and software sales reaching 8.23 mil units. The company's commercial games operations saw sales rise by 14% to Y43.7 bil, vs Y38.3 bil a year earlier, while the company's amusement park operations saw 2% growth in sales to Y43 bil from Y42 bil. For the full year, Sega expects sales at its commercial games division to rise to more than Y100 bil, vs Y84.9 bil a year earlier, while sales within the amusement parks division are expected to rise to more than Y95 bil from Y82.1 bil. Sega claims that by September 1996, sales of the Sega Saturn had reached 5.75 million cumulative units. The company is targeting 7.75 million cumulative unit shipments worldwide by the end of March 1997. Sega Enterprises Ltd said on Tuesday that global shipments of its Sega Saturn game players by the end of December 31 totalled 7.16 million units. A company spokesman said that it was shipping 32-bit video game players at a more rapid pace than originally planned. By the end of 1996, its shipments in Japan amounted to 4.4 million units and in the United States to 1.7 million. Its shipments in Europe by the end of 1996 totaled 900,000 units and 160,000 in other markets, the spokesman said. "Our sales in the Christmas shopping season were as smooth as we expected but industry experts say sales of PlayStation were a little more active," the Sega spokesman said. Sega (Japan), video games manufacturer, had Y126.8 bil parent sales in its 1st-half to September 1997, down 27% from Y174.9 bil in the year-earlier period. Recurring profit was Y12.1 bil, down 5%, partly due to foreign exchange losses. Net profit was Y5 bil, down 16.5% from Y6 bil, mainly due to a loss on a securities valuation. Operating profit was Y12.9 bil, up 7%, helped by a sharp fall in selling costs. Global shipments of Sega's 32-bit Saturn machine were 600k units in the 1st-half, down from 2.35 mil units in the year-earlier period. 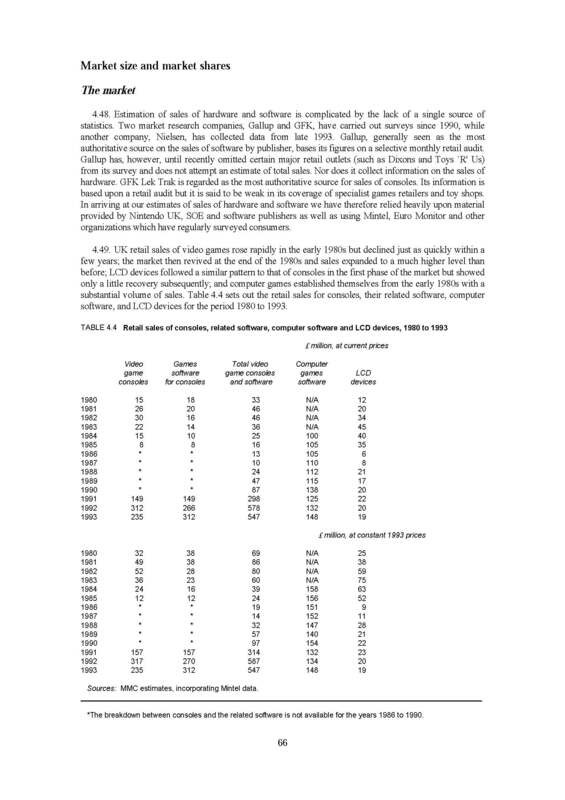 Japanese shipments of the Saturn were 400k units, down from 1 mil, while shipments in Europe and N America were 50k units each, vs 500k and 800k respectively. The Saturn had 5.2 mil unit sales in Japan at end-August 1997, vs 8.5 mil for Sony's PlayStation. For N America, the Saturn had 1.75 mil unit sales at end-August 1997, and for Europe, 950k unit sales. 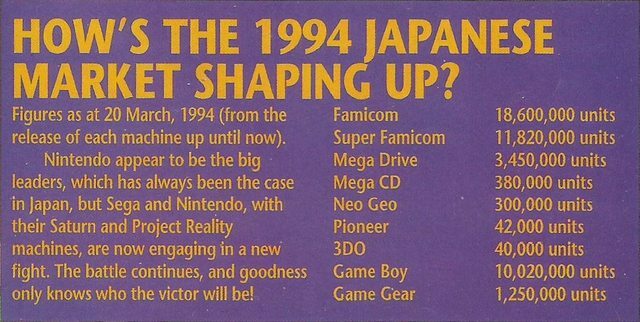 It's interesting to note that in the year ending March 1996 Sega broke the regions down as Japan/US/Rest of the World including Europe. For the year ending March 1997 they then separate Europe from RotW. With Dreamcast from the year ending March 2000 they give separate regions for Japan/US/Europe/Asia, but don't specify RotW. 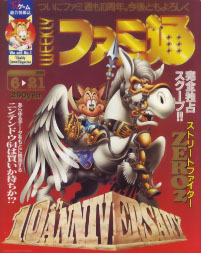 Maybe for the years ending March 1996 and earlier they just broke down the shipments for SoA and SoJ, and bunched all their other WW distributors under "Rest of the World including Europe", which for shorthand was just referred to as Europe. I've seen SCEE do that a lot for PlayStation sales. 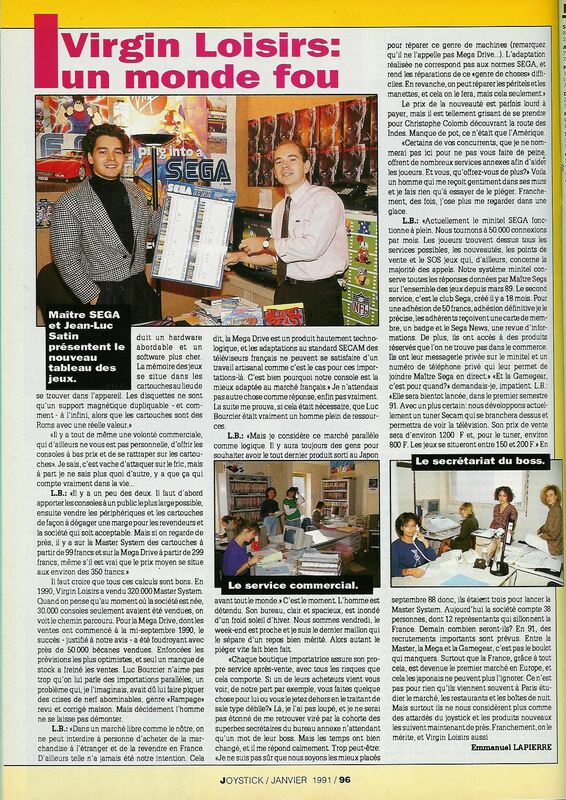 Sega Europe débute 1997 d'humeur optimiste et prévoie des niveaux de vente à la hausse sur ses gammes de jeux vidéo Saturn (32 bit) et CD-Rom PC. Le Président Directeur Général de Sega Europe Malcom Miller précise : "Nous attendons une croissance de notre activité à tous les niveaux. Nous atteindrons notre objectif d'un million de consoles Saturn vendues en Europe pour le début du printemps. 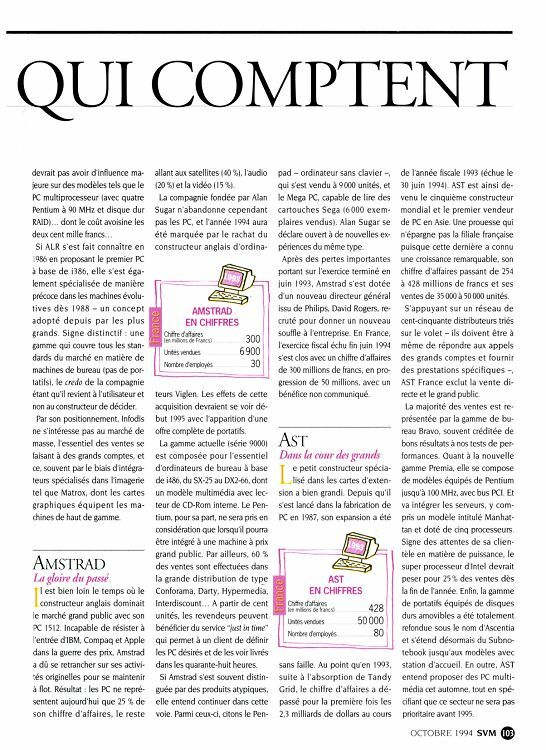 Nous avons également signé des accords de distribution sur de nombreux titres événements avec certains éditeurs, le jeu Quake étant le premier exemple. 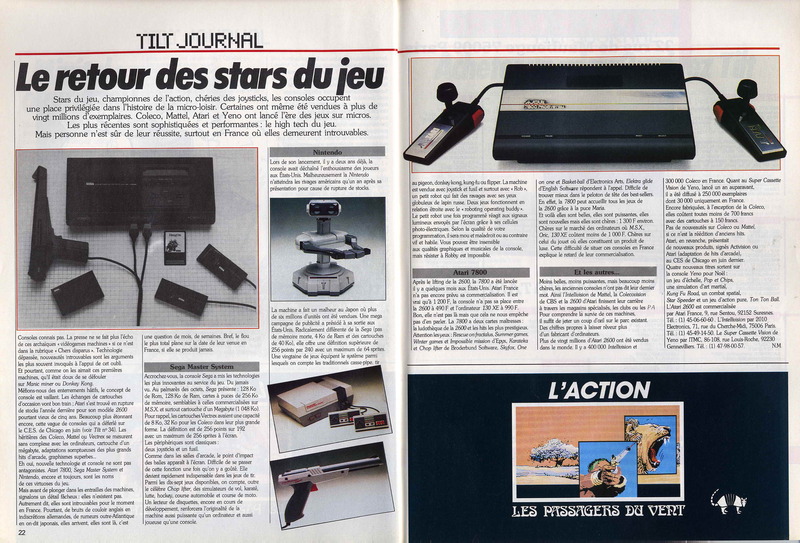 Avec une moyenne de quatre jeux vendus par console, nous bénéficions d'un niveau de rentabilité particulièrement satisfaisant sur notre activité Saturn. Nous-même ainsi que d'autres éditeurs avons atteint des niveaux de vente extrêmement intéressants en Europe. Notre toute nouvelle gamme de jeux PC se porte particulièrement bien avec d'excellentes ventes notamment en Angleterre et en Allemagne. 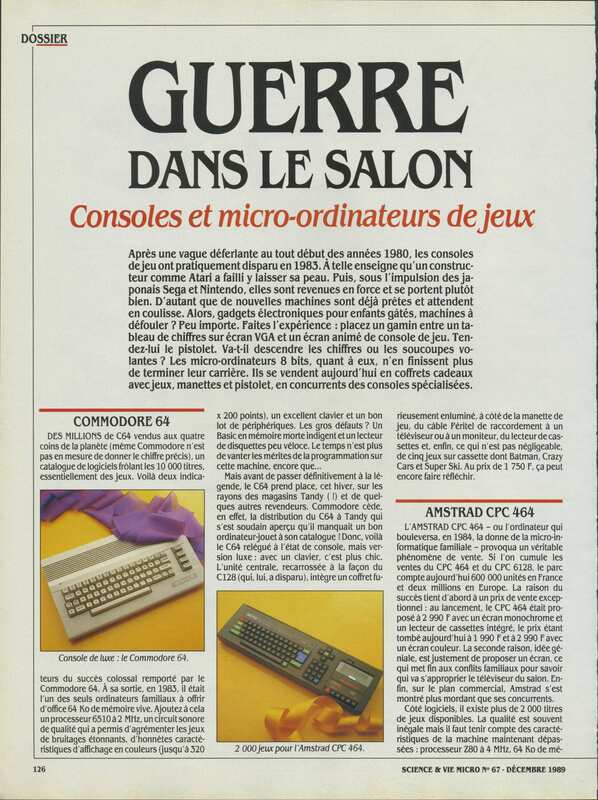 Anticipant une augmentation sensible de la base installée de PC Pentium sur cette fin d'année, nous allons proposer à tous ces nouveaux possesseurs des jeux d'excellente qualité dès le premier trimestre. 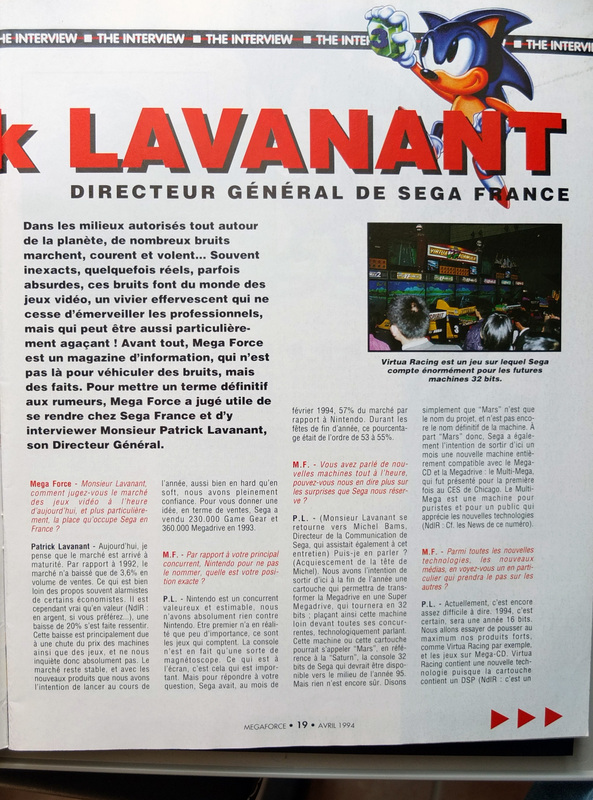 A ce titre nous attendons un grand succès du mythique Sega Rally." 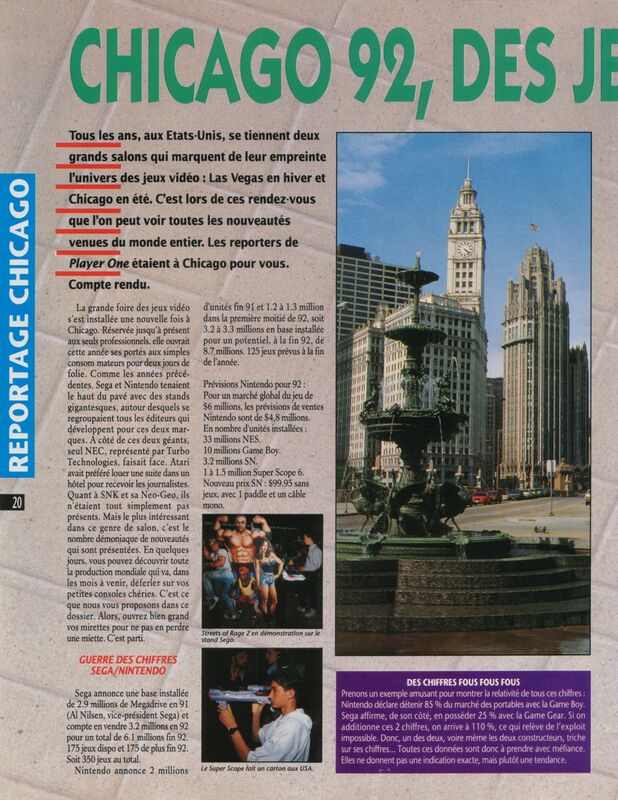 Notre activité sur le segment 16 bit continue d'être très performante en Europe malgré l'annonce par notre maison mère au Japon concernant la dépréciation des stocks de Mega CD et de 32X au Japon et aux Etats-Unis. 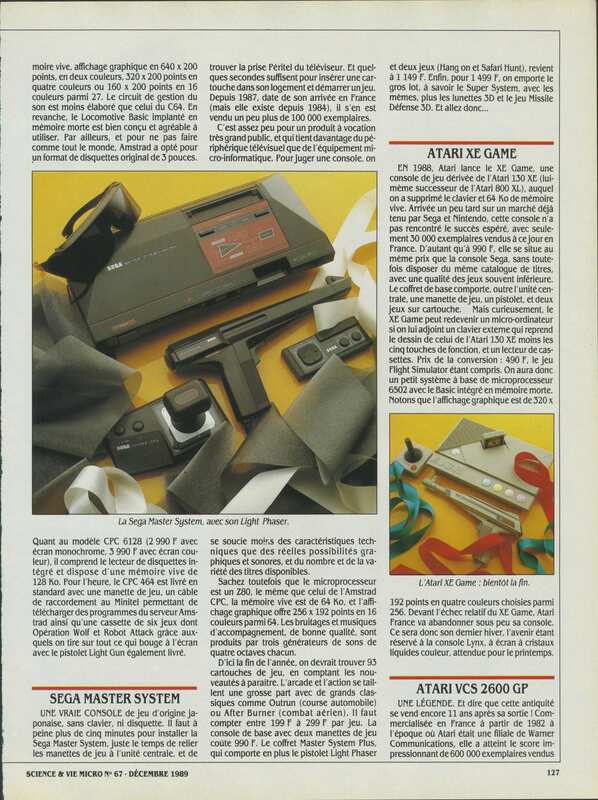 Il y a une base installée de 8 millions de Megadrive en Europe et cela constitue un marché énorme pour le software. 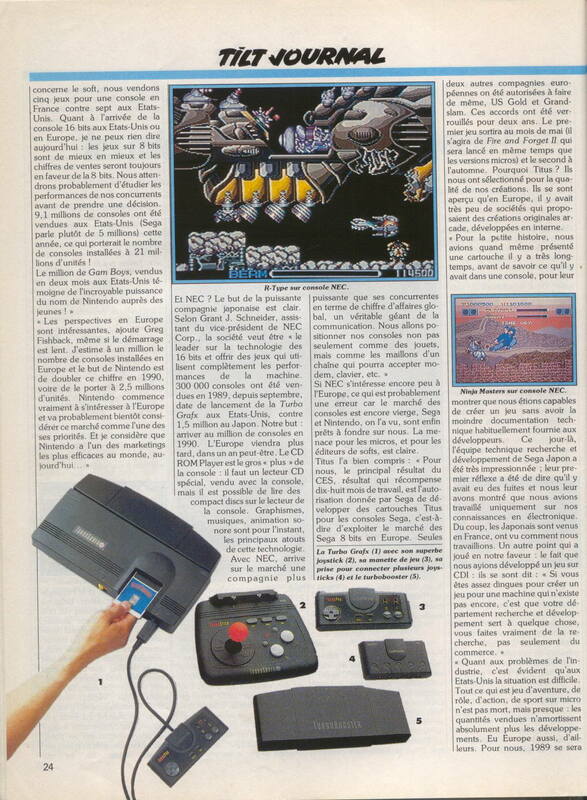 Sega France et Sega Europe sont des filiales de Sega Enterprises, un groupe représentant plus de 20 milliards de Francs, Sega est la seule entreprise présente globalement sur le marché du loisir électronique interactif que ce soit dans les foyers ou dans les centres de loisirs publics. America's favorite 16-bit video game system is about to be invaded by dinosaurs, line backers and major league sluggers. Sega® of America today announced the 1997 line-up of games for the Sega Genesis®, including sports favorites "World Series BaseballTM &#65533;," and "NFL &#65533;" and, from Universal Studio Consumer Products Group, "The Lost World: Jurassic ParkTM." These titles will be available to Sega Genesis's more than 18 million owners starting this summer. "Sega is dedicated to sports fanatics that helped build the Genesis basin," said Bernard Stolar, chief operating officer, Sega of America. "With new titles, added features and improved 3D graphics, Sega will continue to push 16-bit entertainment to the extreme." The 1997 line-up of games will exploit all the 24-meg power and 16-bit graphics capabilities of Sega Genesis. "The Lost World: Jurassic Park" features fast-paced movements amid terrain overrun by dinosaurs. "World Series Baseball" and "NFL &#65533;" will feature all the professional players, real stadiums and up-to-date stats that have made SEGA SPORTSTM the leader in video game sports titles. Sega of America is the arm of Tokyo, Japan-based Sega Enterprises, Ltd. responsible for the development, marketing and distribution of Sega videogame systems and videogames in the Americas. Sega Enterprises, Ltd. is a nearly $3.6 billion company recognized as the industry leader in interactive digital entertainment media, and is the only company that offers interactive entertainment experiences both inside and outside the home. Sega of America&#25263; World Wide Web site is located at (http://www.sega.com). * Always use highest available number, if this isn't sold through to consumers imply that it is. Examples; "in use", "owners" etc actually means shipped to subsidiaries. So, at end of 1996; 8 million MD in "Europe", not qualified with reached or more than, so probably rounded up. June 1997; More than 18 million Genesis in NA. Should be roughly 26 million of international shipments through FY96/97 compared to 25 million through FY95/96 according to Famitsu, and final shipment of 27 million according to CESA. These MD numbers seem to fit the reported shipments. I didn't know the SNES took the US in the end. I'm not terribly surprised, but I thought that was the Genesis strongest region. Interesting to see the SNES still outsold it, even here. Some interesting figures in here, good stuff. 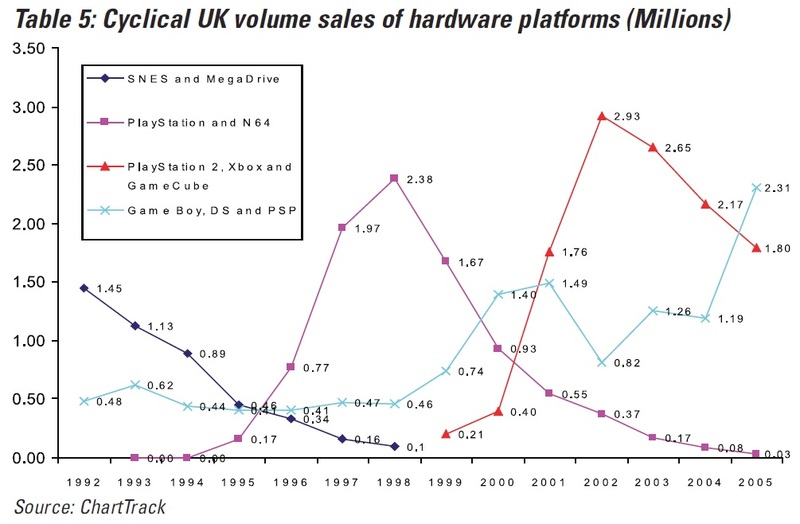 I don't suppose anyone has any data on 8 bit hardware and software sales? I had an Atari 800 XL back in the '80s, and always wondered how many systems were sold, and how well (probably not very...) various games like Bruce Lee, Archon, MULE and the like did compared to the C64 (which I assume blew the Atari 8 bit line out of the water in terms of sales). 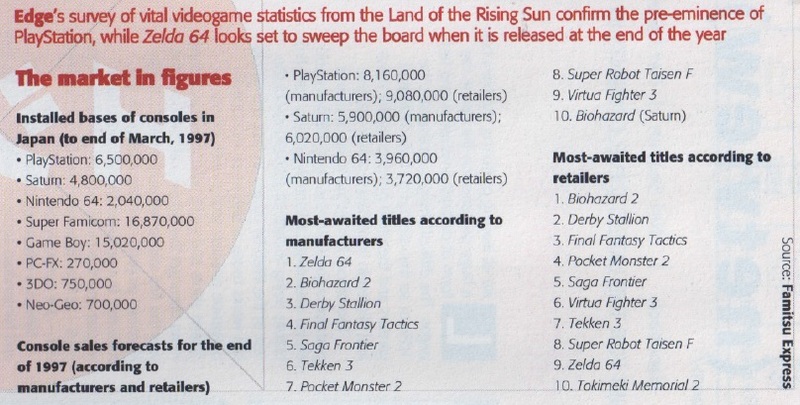 I remember a post from VG Chartzzzz (no, these are not chartzzz numbers), which mentioned Intellivision sales numbers. We have a little bit of official sales numbers from the Blue Sky Rangers (Intellivision programmers back then), but only up to 1983, mike_intellivision posted a list with sales numbers from the game "Intellivision Lives" for the Xbox which included sales numbers for those games. I thought it was time that I put together a thread on sales for the first game system that I owned: the Intellivision. Originally sold by Mattel, the system lasted parts of three decades  1979 to 1990. During its original run (1979-1984) it was sold worldwide: by Mattel in NA and PAL territories, by Bandai in Japan, and by Digiplay in Brazil. (There were also store branded units by Sylvania GTE, Tandy/Radio Shack, and Sears). After the video game crash of 1984, a former Mattel marketing executive bought the rights to the games and existing stock. 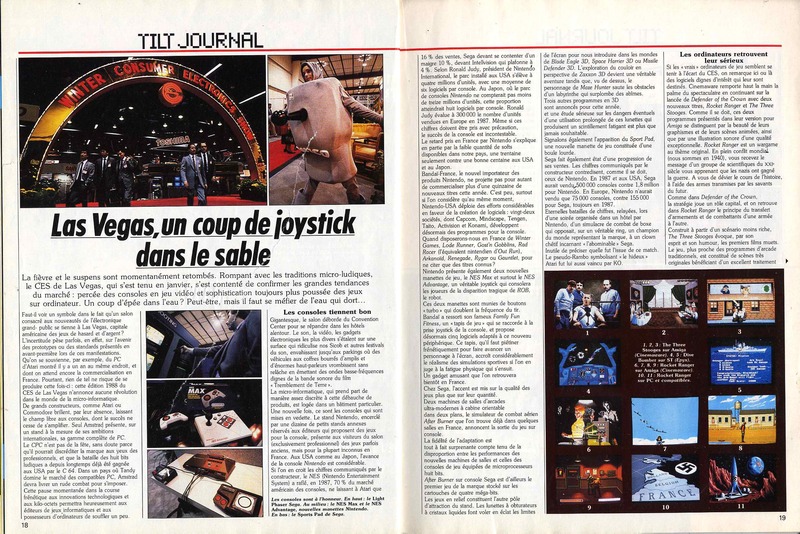 The company  INTV Inc.  sold consoles and games (including some new ones) until it went bankrupt in 1990. So basically, the system started its life competing against the Atari 2600 and ended it competing against the Sega Genesis (and the Atari 2600 which also was still selling in 1990). It is estimated that 6M units were sold, though the original Mattel programmers (the Blue Sky Rangers(BSRs) site only 3M units sold. 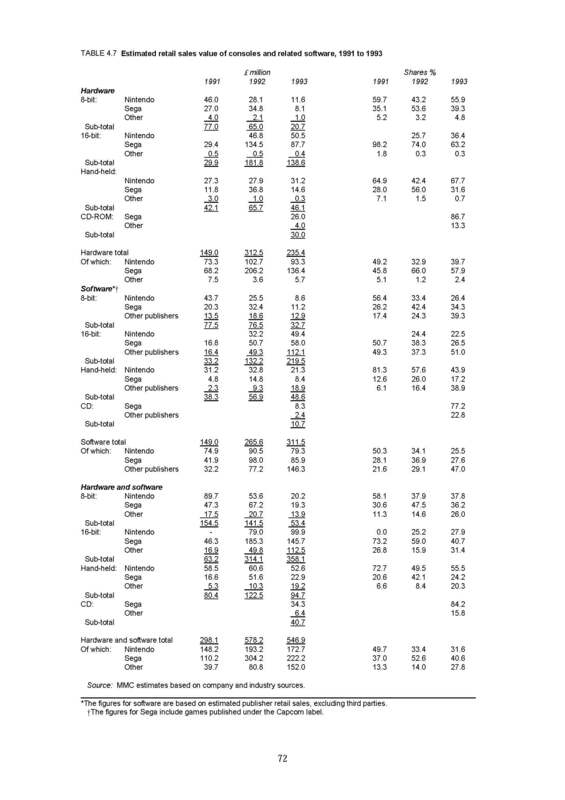 The discrepancy appears to be the result of the BSRs only accounting for the Mattel sales. It is estimated up to another 3M were sold (in some cases apparently as replacement units or back-up units to those who already had bought the system). What is interesting though is that the system had half a dozen million sellers (including pack-ins and bundle offers). And since the BSRs say on their website (www.intellivisiongames.com) that their sales data reflects Mattel data through mid-1983, these were million sellers on a 3M base. Below are the sales figures culled from the Intellivision Lives game  Xbox version. 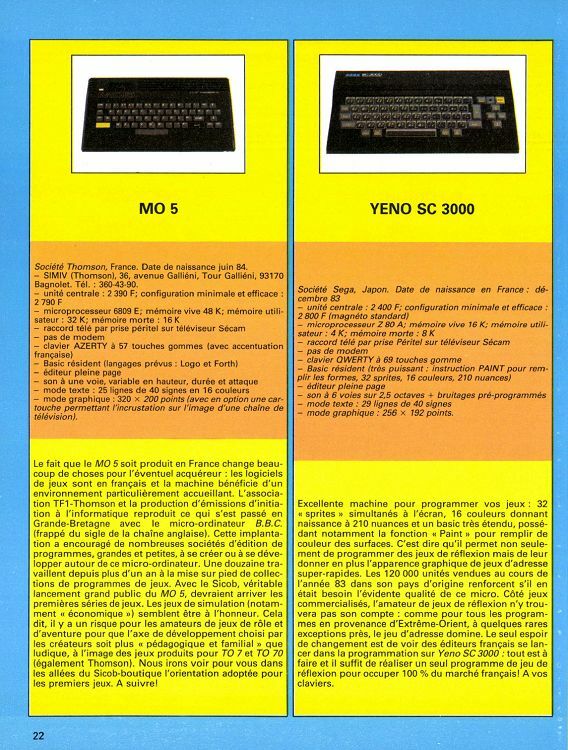 They basically jibe with the limited sales information posted on the website (though some of the million sellers are estimated since they were close but had not reached that point by mid-1983). More sales data when I get it. I just thought this would be interesting. I still don't believe that, because I think the shipment numbers are in Sega's favor. I wonder how you get from the "over 18 million" Sega claims here to the "about 20 million" of the NY Times article from early '98, considering that we know that it's likely that Genesis sales in '97 weren't more than what, 400,000 at most? Interesting, though. Nice to see confirmation that the final US shipment number was way over 18 million -- if the Genesis 3 shipped something like 1.5 or 2 million systems, as I've read it did. 18 million is for North America. If we give 10% for Canada, US sales fell to almost 16 million. Considering Genesis 3 is also NA, 18.5m NPD number for US only may be close to real sales. How do you know it's a North America number? The press release only says "America", never "North America". Also, I don't know, I'd tend towards agreeing with Celine's post below that shipment numbers are better than estimated sales. Yeah, unless they ended up destroying systems or something, it seems reasonable to assume that most produced systems sold eventually, yes? [quote]BTW is PS1 LTD 102,49M related to manufactured units or shipped units? My guess would be manufactured, but is there any way to be sure which it is? I'm currently looking at EAs annual reports (SEC filings) and there is some interesting data, like net revenue per system, thought it is interesting. I'll update this in the future. if anyone has this issue please let us know! How is it even possible those discrepancies? Only with Square games the LTDs seem to not match with the available sources. mmh for Romancing SaGa seems CESA mixed up the first for the second and the second for the third. However it always report japaense shipment even if it is stated it's domestic + international sales. *Note; SMS also released in Germany and Italy in 1986. 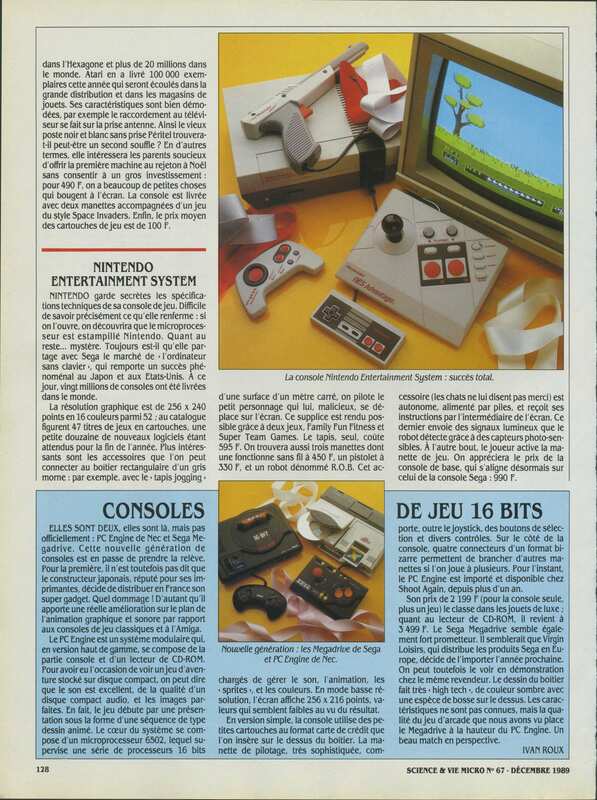 SMS was advertised in Germany as including Hang On for free in the box with the first 20,000 units, which was presumably the initial shipment. Sega made specific German packaging, but not Italian, where Hang On wasn't included either, so presumably the Italian distributor didn't order enough for Sega to bother giving them the same treatment as Germany. It may have also launched in Australia and Hong Kong in 1986, but it would seem unlikely to have shipped more than low-mid five figures outside of US and Japan. I don't pay too much attention to Sega or Nintendo's numbers for their competitors. Nearly 20 years ago a young Californian named Nolan Bushnell invented Pong. It was the world's first video game and consisted of a square ball bouncing between two white lines which the players could move up and down. It was supposed to be representative of tennis. Nowadays consoles can plug into an ordinary TV and play out a Wimbledon tournament on joyticks complete with suitably bowdlerised, computer line calls and player grunts. The market's rate of growth is comparable to the uptake of video recorders in the first half of the 80s. It would also value the console market at nearly 500m pounds by 1995, approximately the same level as the current, static, VCR market. But it's not just technology which has come a long way. The Californian marketing strategies that typified this sector in the late 70s and early 80s might have charitably been described as Californian too. A case of "Let's ride this wave as long as we can". But the surf receded and the market dried up as home computers arrived on the scene. Now it seems history is repeating itself. But if the first time could be described as tragedy, the 1990 marketers are determined that this time it won't be farce-because now the companies are Japanese and not Californian. Nintendo is used to changing with the times. The company made playing cards 100 years ago. Now it earns billions by sellig TV games with an estimated 80% share of the world market. The symbol of its success is a collection of pixels known as Mario. This Italian carpenter first appeared with his brother Luigi on the game Donkey Kong in 1981. Since then he has become an exclusive brand resource for Nintendo, leaping across language and cultural barriers like they were obstacles in another game. But one hurdle he has found difficult to negotiate is the UK. That is until now. Suddenly retailers are falling over themselves to stock Nintendo and its arch-rival Sega, and consumers are scrabbling to buy them. The console market grew from virtually nothing in 1988 to 20m pounds in 1989, 56m pounds in 1990 and forecasts are for between 190m pounds and 200m pounds for the end of this year. The consoles cost between 60 pounds and 80 pounds each. The games vary from 10 pounds to 60 pounds for the most sophisticated "role playing" adventures. And unlike the last boom this time the rivalry between Sega and Nintendo, and the similarity of their products, has the makings of a brand battle every bit as fierce as the Coke/Pepsi war. 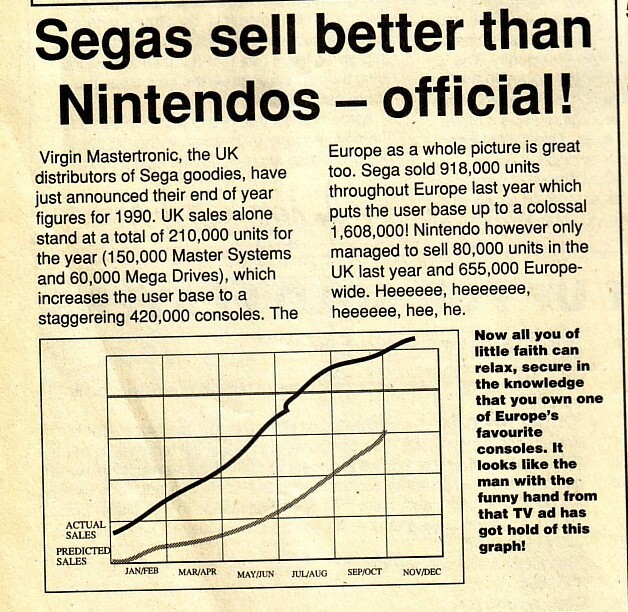 Until last year Sega's distributor's Virgin Mastertronic has a relatively easy time of it. Nintendo had been passed back and forth between distributors unable to sustain a marketing strategy or the essential distribution. Sega meanwhile built up what the trade calls a "hardware base" mainly by tapping youngsters who played Sega games in arcades. However 1990 was seen as the turning point. Nintendo found its feet with the leading toy distributor Bandai while both brands promised unfeasibly large advertising spends (which Media Register has since shrunk somewhat). The first major battle of the brands occurred among the Santa's grottos where they fought for the Christmas present cash. As so often happens in war both sides claimed victory. Bandai's marketing manager Mike Hayes uses data from the market analysts Lek Track to back up his claims. "The fact is that Sega has been throwing figures around that are completely false. We've got audited data showing that in December our share was 62% to Sega's 27%." I think this should be applied to Tom Kalinske's statements about US market share, as well. 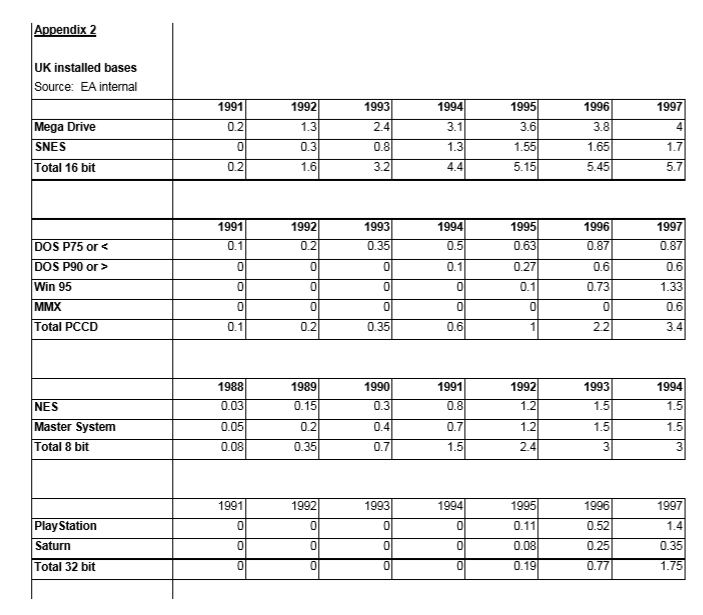 1992-2005 numbers accumulate to 6.190.000 units, leaving us with 440.000 units for 1990 and 1991. The numbers you posted are 453.000 which is quite close. Tekken 3's wikipedia page says it sold 8.5 million units. Anyone have data backing this up? I think it would make it the best selling, non-Smash, fighting game. I saw some NA numbers with the game being around 2.7 million, so I suppose it was a big hit internationally? I probably shouldn't have put 53k for 1990, whilst Nintendo gave LTDs for NES (708k) and GBY (453k), they only gave rounded numbers for 1991 YTD; NES (500k) and GBY (400k), so the exact 1990 and 1991 YTD numbers are probably slightly different. Note that Gallup (who became Chart-Track in 1996) never tracked hardware at this time. GFK Lek Trak did track consumer goods including console hardware, but the commision considered them weak in their coverage of specialist game stores and toy shops, therefore they relied on data from Nintendo UK, SOE, other software publishers and consumer survey data. The chart above uses the latter (Mintel) as a source. 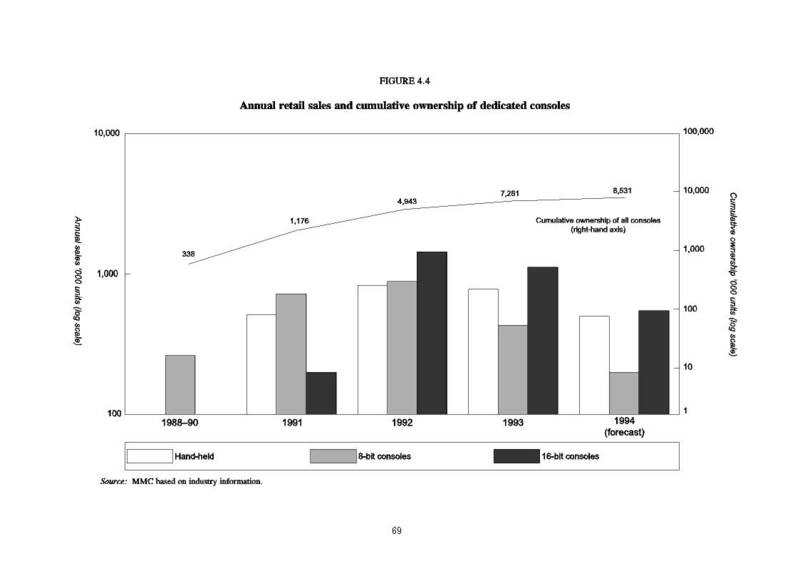 So here we have retail sales based on "company" (ie Nintendo, Sega, software publishers) and "industry" sources. 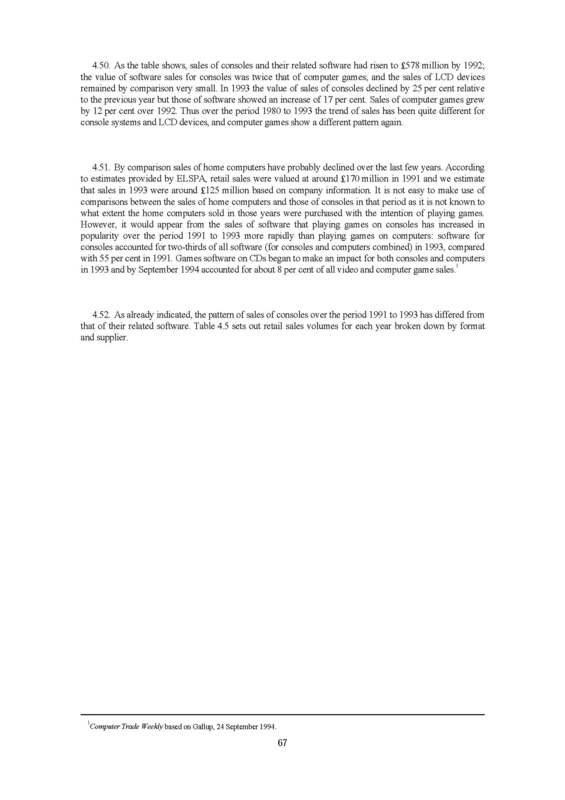 Note that the 1992 and 1993 figures for "SNES & MegaDrive" and "Game Boy, DS, & PSP" from the ELSPA report match the numbers here (when accounting for rounding to 2 decimal places and 3 decimal places respectively. This chart is based on "industry sources", there are inconsistencies with the previous table which was based on company sources as well as industry sources. 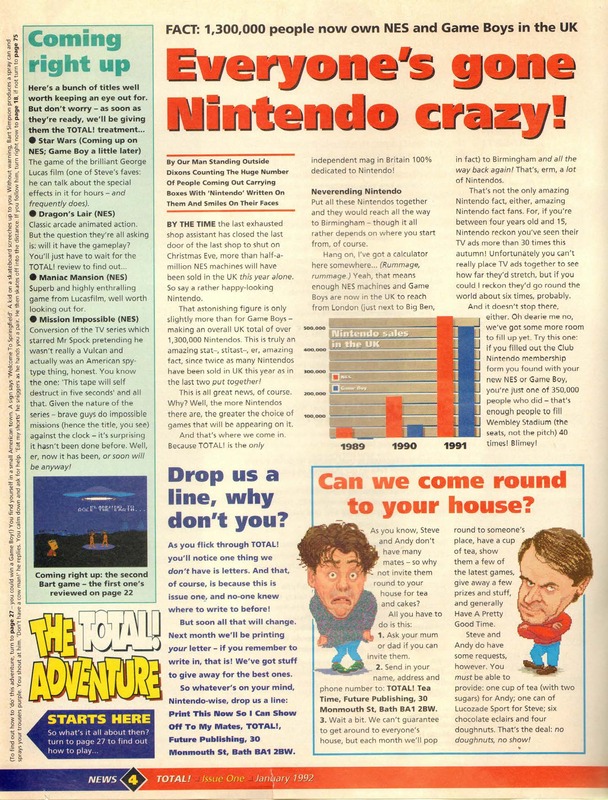 4.67; So here we have it, according to Nintendo UK retailers sold through 2,651,000 units of software at retail in 1993, but they only sold to trade 1,856,000 units due to overshipping in 1992. So the Nintendo numbers in the retail sales charts are Nintendo's internal estimates. Presumably Sega supplied the same data for the commision (reading other parts of the report Sega were far more co-operative than Nintendo). Here are retail value estimates. 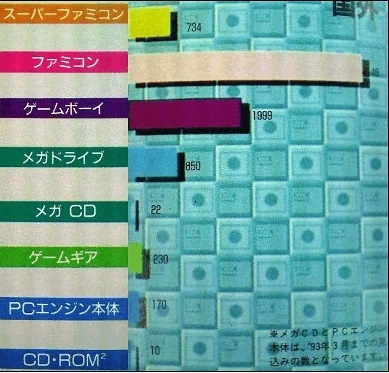 The note that Sega figures include games published under the Capcom label is another indicator that Sega and Nintendo supplied internal data that was used in these charts. So how did Chart-Track obtain data for that chart from several years before they were even tracking hardware? The obvious answer is from the manufacturers, who were members of ELSPA who in turn owned a significant share of Chart-Track. Chart-Track have also spoken in the past of working with publishers and manufacturers to make sure their numbers are accurate. That's a rather long way of saying that the missing Game Boy numbers are 350,000 for 1991, which leaves 83,000 for 1990 (using 3 decimal places for 1991-1993). However, as the years 1994-2002 are only rounded to 2 decimal places that means a margin of error of 5k per year x9 plus a margin of error of 5k on the LTD plus a margin of error of 1.5k for 1991-1993. So 83k +/- 51.5k. Which leaves a pretty large range of 31.5k - 134.5k for 1990. 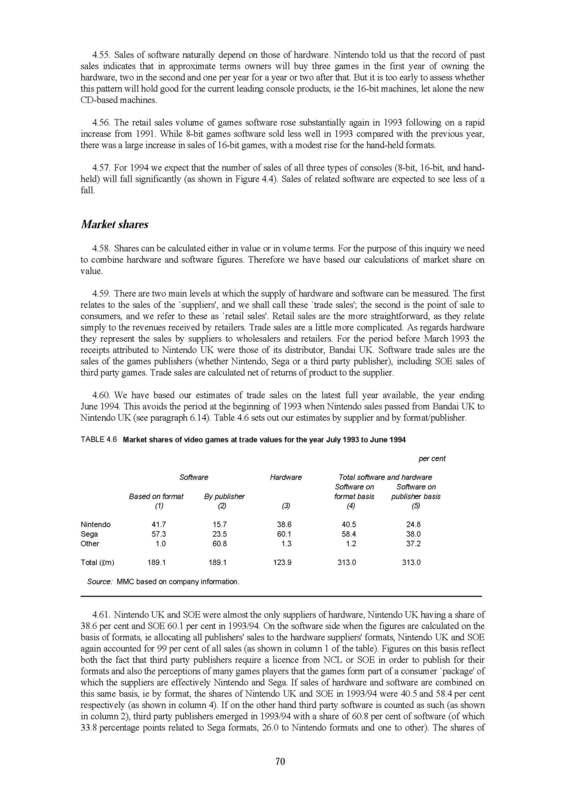 Anyway, I think the numbers given by Sega and Nintendo then are sold in rather than sold through, see how much higher the 1991 NES number (500k) is than the 1991 retail sales figure is (325k). 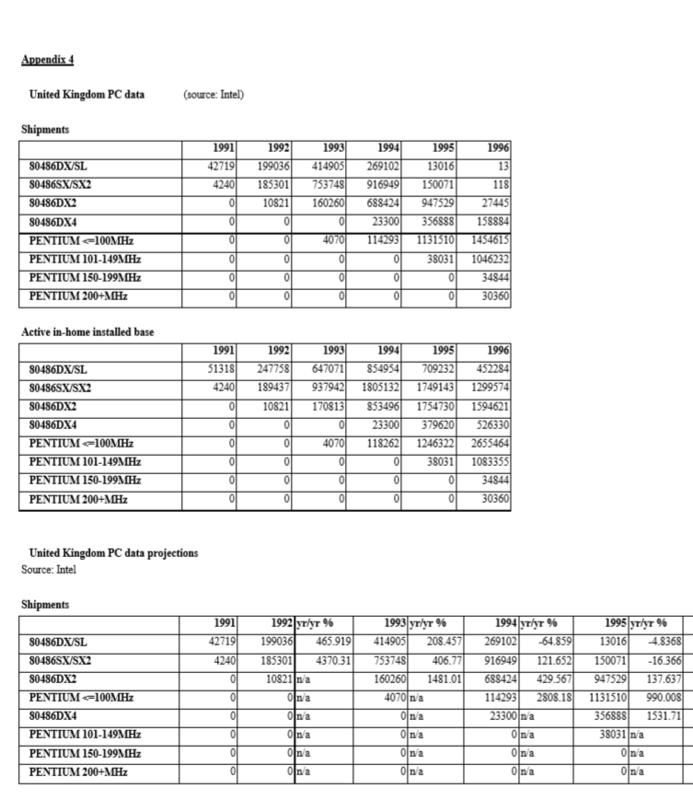 And some PC shipment data directly from Intel.